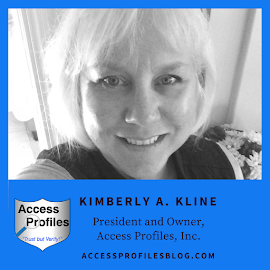 Access Profiles, Inc.: Background Checks ~ What Companies are Really Looking For! 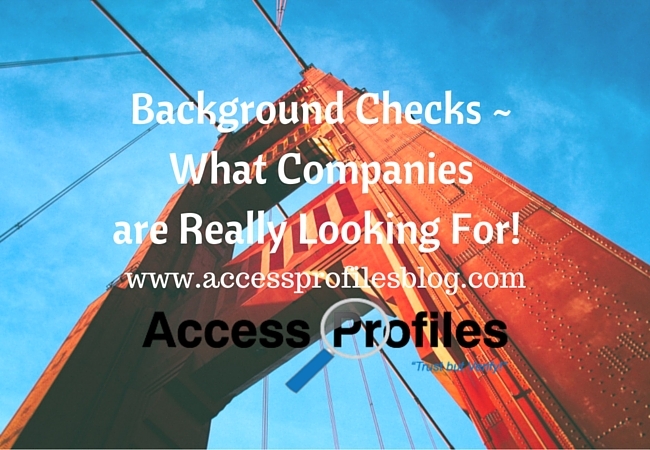 Background Checks ~ What Companies are Really Looking For! Anyone in the market for a new job (whether that be with a new company or for a promotion within) will most likely be subject to a Background Check. What will be searched can vary, both company to company and job position to job position. However, there are common denominators among the majority of Background Checks. And despite employment screening being a common practice, many are still confused about what a company is really searching for and why. Background Checks ~ What is a Company Really Looking for? "Tweet This"
The list below will help clear up any misconceptions and, hopefully, give you some peace of mind when you find yourself facing an employment background check. What an Employer is Looking For ~ The types of jobs you have held, how long you were in a position, did you progress within the company, and your reason for leaving. In addition, they are interested in any projects you worked on or spear-headed while there. Misconception ~ Many believe that embellishing a resume is such a common practice that doing so is not a problem. And others feel like they have to do it to compete in a crowded job market. Both of these are wrong. The Truth ~ For most positions, part of your background check will include past employment verification. Here your prospective employer will contact the human resources department at your old job and ask about your title, your employment dates, and possibly your salary. Being less than truthful about any of these things, therefore, is a good way to get flagged as a liar. What an Employer is Looking For ~ The first thing they want verified is whether you possess the degree or training needed to fulfill the job requirements. They are also interested in determining if you were truthful in the education or skills listed on your resume. Misconception ~ The belief that even if you didn’t graduate, you can lie about your degree because you need it to land the job. The Truth ~ Degrees will be checked! And it is fairly easy to verify if a degree or training certificate has been earned. The bottom line ~ you need to possess the skills to do the job, and any new employer will want to be certain you have what it takes. Find out more about Education verifications in "Hiring ~ Why You need to Verify their Degree First!". What an Employer is Looking For ~ Any past convictions that could jeopardize the safety of a company’s assets, employees, or customers and/or that hinder you from successfully fulfilling the job’s duties. The Truth ~ Background checks are not solely looking for criminal history, it is simply one part of the equation. And many new and updated laws curb what can be considered and even when a criminal record can be searched on any applicant. Most screenings will only be looking for convictions that would directly impact your ability to safely do the job. (I wrote about this previously in my article on convictions versus arrests). And while it is true that people with criminal convictions face a harder time finding jobs, it is not impossible. Those same laws that limit when and how criminal records can be considered also guard against blanket discrimination against former offenders. What an Employer is Looking For ~ Any hint as to what kind of co-worker/employee you will be. Did you fit in at your previous jobs? Did you work well on group projects? Where you able to succeed as a leader? Misconception ~ You can control what an employer finds out about you by listing only what you believe to be “sure fire” references. The Truth ~ You may think you know exactly what your listed references or past employers are going to say about you, but what about those that a screener will develop? Many companies use the references you list only as a starting point. They will then ask those references for anyone else they know who would be willing to answer questions about you. Your best bet is to be ready to answer any questions that may arise, both good and bad, from an inquiry into your past working relationships. Discover more about Employment verifications here! What an Employer is Looking For ~ Anything you have posted on your social media sites that may pose a risk to their company. Misconception ~ Employers can’t search your Social Media sites or that what you post is simply you exercising your “freedom of speech”. The Truth ~ In my experience, Employers use social media in a very limited way, and none will ask for your passwords to your sites. However, that does not mean that they don’t check them at all, or that it is illegal to check them. Most employers will take a look. Their focus, however, is on questionable photos, comments perceived to be vulgar or radical, etc. They really want to know whether you illustrate good judgment about what you post. An article I wrote previously on the use of social media in background checks can be found here. Remember, employers will run some type of a background check before hiring you. The job market is crowded and employers are rightfully concerned over making safe hires and avoiding litigation. Being prepared on your part will go a long way towards making the process less mysterious and alleviate your concerns. That preparation should include a preview of what is “out there” about you. To that end, I recommend you run a background check on yourself before you apply. You can find tips on how to do this here. 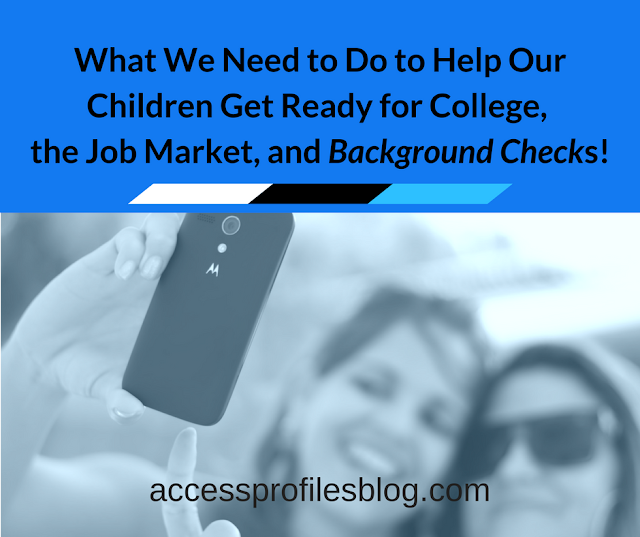 After you have that information, it is time you get your entire resume “background check ready” (find out how here). You will find that doing the work beforehand will give you peace of mind and increase your chances of landing the job. We will guide you in creating Your "Background Check Ready" Resume and in Finding out what is "Out There" about You! Find out more About Us and our Background Investigation, Business Mentoring, and Security Consulting services! Check out our FAQ & Resources page too!